No it’s not a bird, no it’s not a plane. It’s Colin Koeppen, rural Boone County resident, flying his powered parachute all over Boone County. 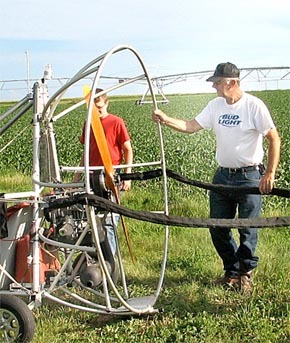 Koeppen bought the early 1990 model, single-seated powered parachute last fall, but was unable to take it up until this past spring. Last winter, he taught himself how to fly the parachute and by Easter Sunday, the wind was calm and he felt comfortable enough to get in and try it out for the first time. “Every flight is an adventure,” remarked Koeppen. The parachute will go about 30 miles per hour and has enough gas for about an hour and 15 minutes of flying. Read more in the Dec. 7 Albion News Print & Electronic Editions, available by subscription.